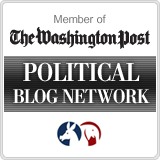 Third Base Politics: Has Mitt Romney already won Ohio? We've previously talked about the early vote game in Ohio and how the early numbers looked good for Republicans and not so good for Ohio Democrats. But those numbers were only looking at absentee ballot requests by mail. Now that early voting is almost complete, how are things looking for Mitt Romney and down-ticket Republicans? That's a net difference of 263,256 votes in favor of Republicans. In 2008, Barack Obama won Ohio by a margin of 262,224. Incredibly, before election day has even arrived, it appears that Mitt Romney has completely eliminated Obama's margin of victory. Think they're worried about this? You bet they are. Check out Obama advisor David Axelrod on Fox News this morning. When asked about these numbers, he doesn't offer his usual smarmy reply. He has no response. The good news doesn't end there. 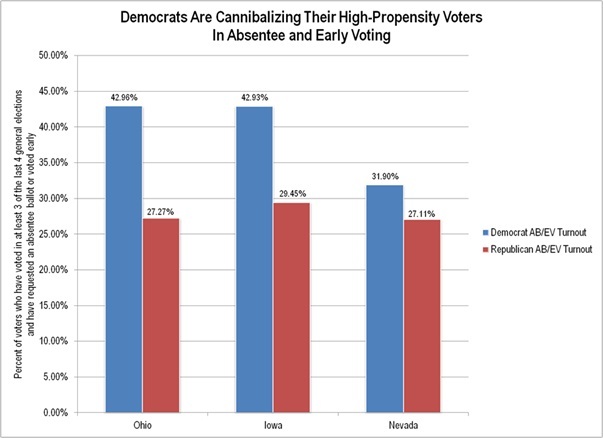 Data also shows that Democrats have "cannibalized" many more of their high-propensity voters than Republicans have. High-propensity voters include those who have voted in at least 3 of the last 4 elections. They are the most reliable voters, the ones like you and me. While Ohio Democrats have focused on getting their reliable voters to bank their votes early, Republicans have concentrated on getting more "low-propensity" voters to vote early, since they aren't as reliable to count on on Election Day itself. Check out the chart below. Democrats have turned out almost 43 percent of their high propensity voters in Ohio, while Republicans have only turned out 27 percent. So, at the end of early voting, Republicans have erased Obama's 2008 lead, and have many more reliable voters left to vote on Election Day than the Democrats. In fact, the RNC says that Republicans have 368,000 more high-propensity voters left than the Dems do, or a 71% advantage. We've heard a lot of talk about how close the contest is in Ohio, including from yours truly. But wouldn't it be a pleasant surprise and a sigh of relief if Mitt Romney wins Ohio much more easily than most people expect? If he does, he will almost certainly be the next President of the United States. I hope this analysis is correct. One other thing I noticed from the latest Columbus Dispatch Poll -- the 515 respondents from NE Ohio (out of about 1500 total) were preferring Obama over Romney by only 10 points (54% to 44%). If that actually happens Obama will lose Ohio as the poll also shows SW Ohio going huge (about 60% vs 39%) for Romney. I'm not saying it will actually GO that way on Nov. 6th but if the Dispatch percentages were correct a clear Romney win would result. No doubt it my mind. I worked for Portman's campaign. The county trends show Romney is going to win. Just get out and VOTE! Thanks for this analysis. This seems like great news, but what about independents? How many ballots requested/early votes cast? If we knew that number, we could simulate a few different scenarios (i.e., independents split evenly or lean to one candidate) to really understand the potential size of this gap. My guess is that independents tilt somewhat to Romney, so the gap is larger, but I would like to see these numbers. Thanks if the author can help out. Regardless, get out and vote! Shorter Nick: Romney's going to win, according to Romney campaign. Isn't it cute that Modern came out of retirement this election season, just to harass us here at 3BP? Follow up comment. I expect the Dispatch Poll is really "yester-tech" -- sending out questionnaires via snail mail and back is too slow for today's polling? Yes? Also if you look at the geographic distribution of D-Poll respondents you see that central Ohio (aka Columbus media area) is WAY "over polled" -- this area is 18% of Ohio's population but 34% of the responses came from there. Probably because it is the Columbus paper? But anyway you see the point -- if you only sampled Cuyahoga county of course it would not predict Ohio's vote totals would it? Same with the Dispatch poll -- the sample does not reflect Ohio properly. Another example, SW Ohio (i.e., Hamilton and 16 surrounding counties) has 25% of the population but only 15% of the responses came from that region. That is why I think the poll is only useful in gauging voter preference within the individual regions alone and not useful for predicting the state-wide status of a candidate. Just my opinion of course. Vote tomorrow...and triple check your ballot to make sure your Romney vote doesn't wind up being changed to Obama. Ugh.